David Barton’s Capitol Tour: Did Thomas Jefferson Spend Federal Funds to Evangelize the Kaskaskia Indians? 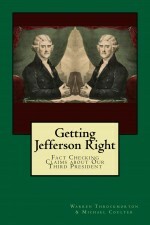 Most people have no clue that Thomas Jefferson in 1803 negotiated a treaty with the Kaskaskia Indians in which Jefferson put federal funds to pay for missionaries to go evangelize the Indians and gave federal funds so that after they were converted we’d build them a church in which they could worship. One reason people have no clue about this story is that it didn’t happen that way.